Located within CNN World Headquarters and connected to the Georgia World Congress Center the luxuriously renovated Omni Atlanta Hotel at CNN Center combines an International flavor and sophisticated amenities with the friendly hospitable spirit of the South. Our 1059 elegantly appointed guest rooms and suites exude sophisticated style and modern amenities including wireless internet access and an oversized workstation plus fully stocked refreshment center and exquisite marble bathrooms complemented with fluffy bathrobes. Guests can enjoy the exceptional menu at the Prime Meridian Restaurant or explore world-renowned restaurants and attractions right at our doorstep. The Omni Atlanta Hotel at CNN Center is connected to Philips Arena and is the closest hotel to the Georgia Dome. Atlanta Hartsfield International Airport is only a 15 minute drive away. All rooms are non smoking. Four diamond luxurious comfort embraces style. For GPS devices please use 190 Marietta Street NW rather than the hotel street address. This address will provide the most appropriate driving directions to the hotel. Hotel is 100 percent non-smoking. For GPS devices please use 190 Marietta Street NW rather than the hotel street address. This address will provide the most appropriate driving directions to the hotel. The Omni is located in the heart of downtown Atlanta within CNN World Headquarters and across from Centennial Olympic Park and is the closest hotel to the Georgia Dome and the Georgia World Congress Center. 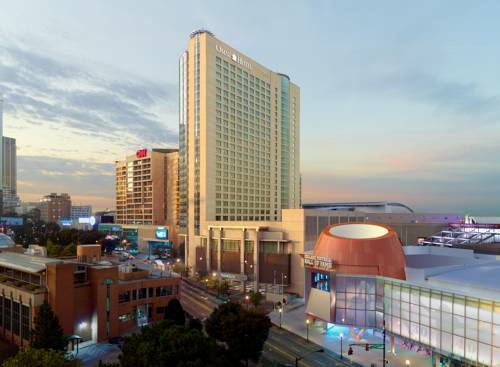 The hotel offers easy access to major attractions in downtown Atlanta including numerous restaurants and shopping plus recreational activities such as the Georgia Aquarium and the World of Coca Cola plus Atlantic Station and the zoo as well as museums and the Botanical Gardens. The hotel is situated on the Marta Rapid Transit System and is convenient to Interstates 85 and 75 and is only a 15 minute drive from Atlanta Hartsfield Jackson International Airport. Located in South Tower. Renowned for its outstanding location and magnificent city views overlooking Centennial Olympic Park. Prime Meridian offers exceptional fare in an elegant atmosphere. Open Daily from 0630 to 1030 hours and 1130 to 1430 hours and 1700 to 2200 hours. Located in the South Tower. Latitudes Bistro and Lounge is a sophisticated gathering place offering specialty drinks and appetizers. Perfect for a drink and snack after an event at the Georgia Dome or Philips Arena. Open Daily from 1500 to 0100 hours. Located in the North Tower. Morsels coffee shop offers freshly brewed coffee and specialty coffee drinks as well as delicious pastries and other snacks. Open Daily from 0600 to 1730 hours. Museum and Galleries open Mon-Fri 0800-1700 hours. City Center is within walking distance from the property and there is public transportation adjacent. Amtrak is 3.5 miles from property and closest MARTA stop is 1 block.